Chicken Farcha (or Marghi na Farcha) is the Parsi version of fried chicken. Parsi recipes are a fusion of cuisine from Persia and India (specifically Gujarat), they love their food and are great cooks. Perhaps it’s because of the lovely food they eat they all are such lovely people too. For this recipe of Chicken Farcha I used a Parsi cookbook given to me by my dear friend, Parizad Major, as a guide. Thank you, Pari. Farcha is served as a starter on almost every occasion. Extremely easy to cook, it’s the best version of Indian fried chicken. However, instead of deep frying the chicken I used my Philips Airfryer and my Airfyer did a great job in preserving the authentic taste and yet making it a bit more low calorie, guilt free and healthy. Clean the chicken drumsticks and make horizontal slits in it. Marinate the chicken drumsticks in Ginger paste, Garlic paste, Turmeric powder, Vinegar, lemon juice, Chilli Powder and salt and keep it on the counter for about an hour (or 3-4 hours in the fridge). If keeping in the fridge take it out an hour before frying so that the marinated bird comes to the room temperature. Lightly beat the eggs and add the cornflour to it along with a pinch of salt and a bit of chilli powder. 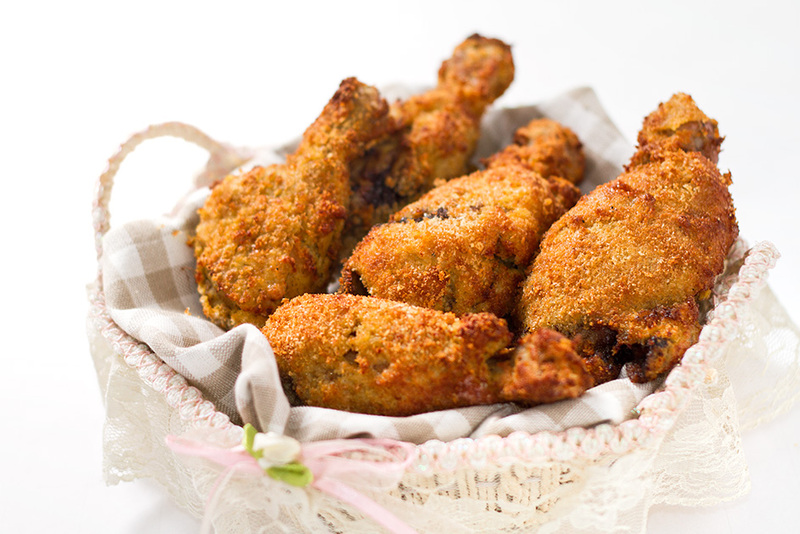 While the Airfryer is preheating, take out one drumstick at a time, remove the access marinade, dip the drumstick in the eggs mixture, and roll them in the bread crumbs. Arrange four drumsticks at a time in the Airfryer tray, brush the tray as well as the bread rolled drumsticks with oil and let them get nicely browned in your airfryer. Keep checking it after every 7- 8 mins and keep brushing them with oil if they look very dry. It takes about 15 minutes or so for a batch of drumsticks to be ready. If you want to reduce this time put the entire batch of drumsticks before dipping them in the beaten egg mixture in a microwave for about 5 minutes. Serve the Chicken Farcha hot. The basic feature of a Parsi lunch is rice, eaten with lentils or a curry. Curry is made with coconut and ras without, with curry usually being thicker than ras. Dinner would be a meat dish, often accompanied by potatoes or other vegetable curry. Kachumbar (a sharp onion-cucumber salad) accompanies most meals. Thanks for this one. But please have a separate list of your air fryer recipes.